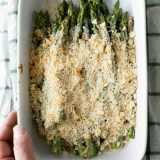 Only 4 ingredients make this Creamy Baked Asparagus a breeze! It’s quick and easy and perfect even for a holiday dinner. Bring about half an inch of water to a boil in a skillet. Add the asparagus and cook for about 2-3 minutes – it should be bright green and still crisp. Drain the water. Toss the asparagus with the ranch dressing, and place in a 1 1/2 to 2 quart baking dish. Sprinkle with the cracker crumbs and then the cheese. Bake for 10-15 minutes, or until the cheese is slightly brown and the asparagus is heated through.